Has anybody seen this new product or has used this new product? Any thoughts about it? I hope this website gets you there. There was a rep handing them out at the ECF meeting but I haven't used them enough to have an opinion. They seem to cost almost 4 times what a wire nut costs so you have to ask how much labor they save. Touting that three of them fit thru a 1/2" KO may lead to abuse, and splicing in small raceways? That's my concern ... as I see it, we still MUST have the splice in a box, and MUST have the required pigtail. Maybe they were- does this gizmo qualify as a non-reversable crimp splice? What did they have UL evaluate it as? I was trying to come up with the legal scenario about why you would need to pass a splice through a KO myself. They show a made up box with the pigtails sticking out implying you just terminate the wires, snap in the the RX connector and walk away. Maybe these boxes will come in prewired from China. For that use, Ideal already offers their "In-Sure" connectors. As I see it, this new connector is only of value if you plan on pulling the splice into the pipe. OK, I thought I was the only one going down that path. Next will be the locknut that installs from the exterior of the box. Seriously, I can see an advantage on a job with a lot of pre-fab devices, but, Ideal guys...use the correct connector!! If I was really doing a prefab job I would use snap in connectors. This should be scary to professionals since they are dumbing this down so much. The other question is what would you look at on the rough if the boxes were not there yet, just the stapling? Who inspects the prefabbed boxes? U/L? This brings up more questions than it answers. How do these devices really differ from them terminals in electronic lighting ballasts? I've seen a LOT of them burn out in the last few years, wether by vibration or elevated ambient temperature. 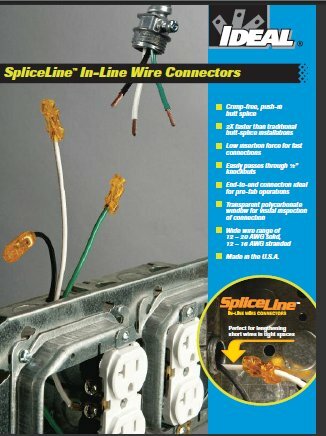 The ad also mentions that when you use a stranded wire, you don't need to twist it up first. How then, do you make sure that all of the strands are in the clamping part of the connector? I mean, for something that has such low insertion force, it makes me wonder exactly how much pressure is on the wire itself, if it isn't enough, I can see a poor connection occuring. I can see that these things would be pretty good for wiring repairs, but I don't think I'd use them for any new work.